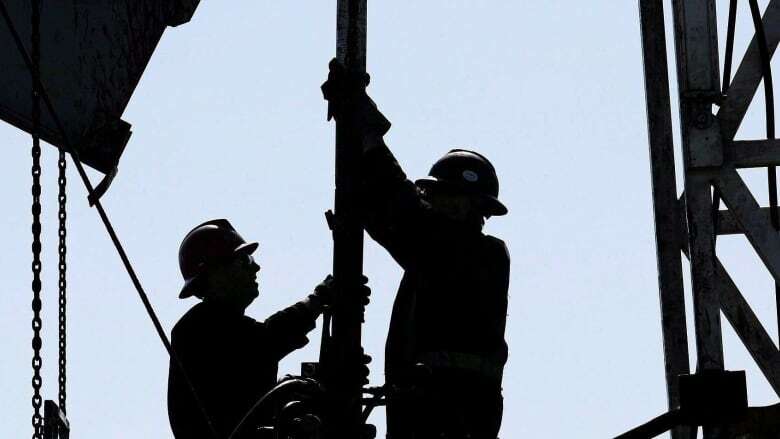 Sales of rights to drill for oil and gas in Alberta are on pace this year to set a historic low, five years after the province raised a record-setting $3.5 B in drilling permit auctions. Five years after Alberta raised a record-setting $3.5 billion at auctions of provincially owned oil and gas drilling rights, sales are on pace this year to set a historic low — part of a downward trend seen across Western Canada. Through the first seven months of this year, companies invested just over $75 million for the right to drill for oil and gas on Crown land, according to the provincial Energy Department. If sales continue at the same pace through the balance of 2016, they will add up to about $125 million — more than $100 million less than any annual figure in records going back to 1978 when the province adopted a scheduled sales process. A big difference between 2011 and 2016 is the political party in power — the Progressive Conservatives then and the New Democratic Party now — but even the harshest critics of NDP tax increases and climate change policies say that's not why land sales have dried up this year. Nor do observers pin the lack of interest solely on the two-year global oil price slump. "You can talk about royalty rates and tax rates and you can talk about the government fiscal regime, the investment climate, interest rates, but in the oil and gas business, you can't beat the rocks," says David Yager, a Calgary oil and gas consultant and outspoken supporter of the Opposition Wildrose Party of Alberta. "What was discovered (leading up to 2011) was the source rock, the Montney and the Duvernay. The Montney in particular may be one of the greatest hydrocarbon and natural gas liquid reservoirs in Canada, if not in North America or the world. "As soon as we find another of those, the land sales will spike again." 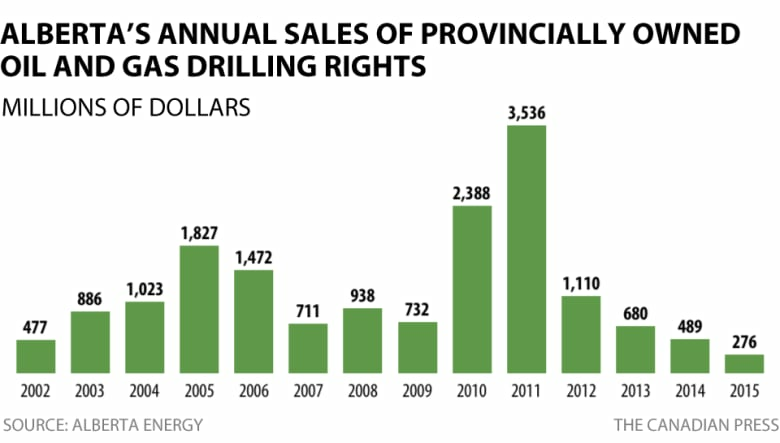 Alberta is not alone in posting lower sales for drilling rights. B.C. is also on pace to set a new record low with only $4.7 million raised from such sales so far this year. Its best year, according to government statistics, was 2008, when it raised $2.7 billion. In Saskatchewan, about $12 million has been raised in the first half of 2016, the lowest year-to-date total since 1992. Its record year was also 2008, when it generated about $1.1 billion. "Are we at pretty low numbers? Yes, that's a function of the cycle," said Brad Herald, Western Canada vice-president for the Canadian Association of Petroleum Producers. "When cash flow is scarce, we do less on raw exploration." Sales processes differ slightly between provinces but generally, producers nominate land they are interested in developing and the province then invites sealed bids on the parcels. The winning bidders must drill wells on the property within a certain time period — two to five years in Alberta, for instance — or it goes back to the province. "It's a different world now," said Gary Leach, president of the Explorers and Producers Association of Canada. "I think a lot of people expect maybe some of those leases that were bought may be reverting back to the Crown." The Montney and Duvernay are still the rock stars of the oilpatch, although drilling levels have been halved since last year. Brad Hayes, president of geoscience consulting firm Petrel Robertson, said oil and gas explorers have long known about the two formations because they drilled holes through them while seeking other zones. But it took the combination of horizontal drilling and multi-stage hydraulic fracturing or "fracking" before they could be profitably exploited, he said. "Companies developed the technology and suddenly they could see value in huge tracts of land," Hayes said. He said the boom turned to bust starting in 2012 simply because producers had bought up most of the best land. In its spring budget, the Alberta government estimated it will collect revenue of just $95 million from land sales in the 2016-17 fiscal year ending next March, rising to $157 million the following year. Debt delinquencies spike nearly 15% in Alberta but dip in Ontario and B.C.